This Friday, May 25th, will be the second annual International Cash Mob Day. 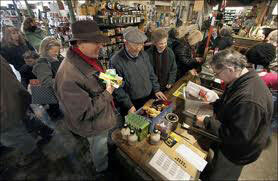 The idea of a Cash Mob is to support local small businesses by organizing a group of people to visit them, with each member willing to spend $20 or more. The goal is for members of the community to help attract new customers to the businesses they love so they can keep the doors open and thrive against the “big-box” stores. Many regard small businesses as the backbone of the economy. Recently, the U.S. Small Business Administration affirmed this notion when they reported, “Quarter by quarter, small businesses with fewer than 500 workers outperformed large firms in net job creation about three out of four times from 1992 through 2010 when private-sector employment rose.” In other words, small businesses created more jobs than the big guys about 75% of the time. People who join in cash mobs wish to do their part. Pick the local business you want to support. Choose an independently owned, local shop. Get the permission of the business. Just call up and ask the manager or owner if they can deal with the influx of people. Start a Facebook and Twitter account for your cash mob. Make posts about the time and day, but do not tell anyone exactly where it is taking place. Participants usually do not find out until just before the cash mob starts. Call up the local newspaper and throw in key words like “local economy” and “job creation” to get their attention. Give the media your Facebook and Twitter names, but continue keeping the location a secret. If you own a business or work for someone else, try to get your employees or co-workers involved. If you can get lots of people to commit, try having everyone wear something with the company logo to draw attention to your company, too. Spread the news as much as possible by word of mouth; not everyone is on a social media website. 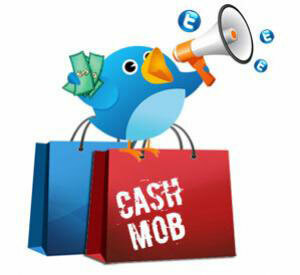 On the day of the event, send out tweets and Facebook messages revealing the location of the cash mob. Have someone on site to act as security to direct traffic to ensure everyone parks correctly and knows where the cash mob is occurring. If you plan on having more than 100 people in attendance, you may want to hire a police officer to prevent mishaps. When the cash mob is over, all that remains is meeting up at a local restaurant or pub to discuss the event’s success and plan the next day of mobbing. Revel in the success and share in the party mood. The key is, almost all locations are picked by someone who is loyal to that particular business. They suggest it and get it organized. Do you have a regular customer or client who just loves your business? As I covered in a previous blog, do you have an advocate who would help promote you? If so, that may be the easiest way to get started. If not, perhaps you should consider helping someone else. Is there a business near you which may benefit from such an event? Organize a cash mob for them and really promote it. While you will be doing something very nice for someone else, you may receive publicity which looks positively on your own business. And, who is to say that business may not repay the favor? 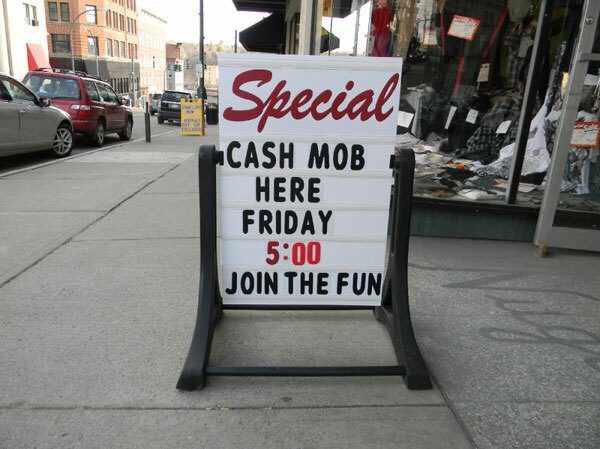 Of course, whether it helps your business or someone else in the local community, cash mobs are a clever guerrilla marketing idea. It builds community, creates awareness, offers networking and allows people to have fun. Which local small business will you help support? Go to CashMob or this Cash Mob Blog for more details. Give Feedback! 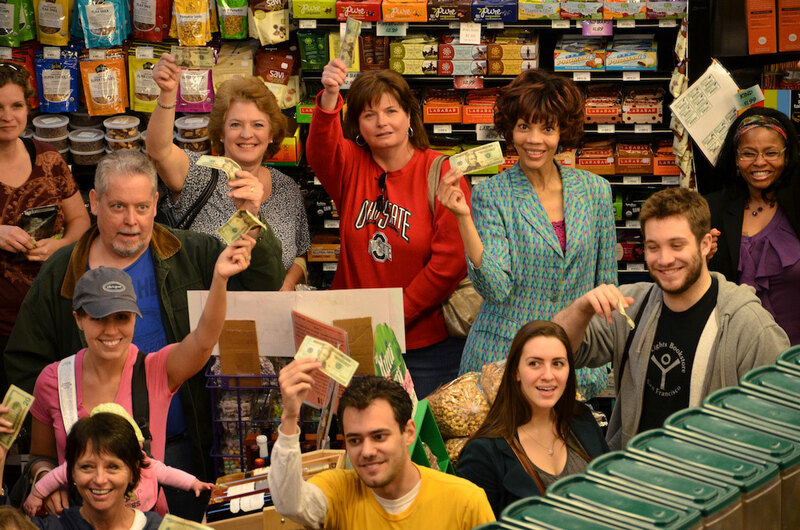 Have you been involved in a Cash Mob? Do you think it does good, or is just a band aid on real economic issues our country’s small businesses face? This entry was posted in Customer Loyalty by RickVerbanas. Bookmark the permalink. I love this idea! Local comic shops are the perfect venue for this, as they are almost always cash-strapped and could use the influx of new customers. Amen, Ed! As a former comic shop guy, I would have loved to have seen a crowd like this. Usually, I got my huge crowds running a promotion or event, often tying in with a movie like an Avengers. Random crowds would have been a real blessing.